In the growing realm of mobile news, men and the more highly educated emerge as more engaged news consumers, according to a new study by the Pew Research Center’s Project for Excellence in Journalism, in collaboration with The Economist Group. These findings parallel, for the most part, demographic patterns of general news consumption. But there are some important areas of difference between mobile and general news habits-particularly among young people. While they are much lighter news consumers generally and have largely abandoned the print news product, young people get news on mobile devices to similar degrees as older users. And, when getting news through apps, young people say they prefer a print-like experience over one with high-tech or multi-media features. These are key findings of an analysis of mobile news habits across a variety of demographic groups. This report builds off an earlier PEJ and The Economist Group report, The Future of Mobile News, which found that half of U.S. adults now own mobile devices and a majority use them for news. Both reports are based on a survey of 9,513 U.S. adults conducted from June-August 2012 (including 4,638 mobile device owners). Men, especially young men, are heavier mobile news consumers than women. 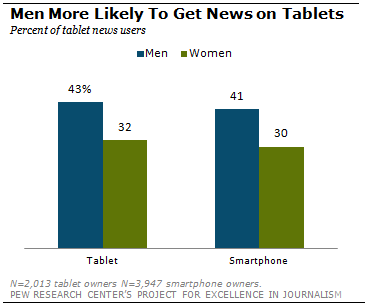 More than 40% of men get news daily on either their smartphone and/or tablet, compared with roughly 30% of women. On the tablet specifically, men check in for news more frequently and are more apt to read in-depth news articles and to watch news videos. Women, on the other hand, are more likely than men to use social networks as a way to get news. Level of education is also tied to mobile news choices. The college-educated get news through mobile apps to a greater degree than those with less education (app use overall is tied to greater news engagement). College graduates are also heavy readers of in-depth articles on tablets. But the less well educated more often report that reading the news on tablets is adding to their overall news consumption rather than just replacing news they once got in other ways (49% versus 36% for college graduates). One area where younger users distinguish themselves involves advertising in the tablet news space: 18-to 29-year-old tablet news users touch or click on ads when getting news to a far greater degree than older generations: Fully 25%, versus 12% of 30- to 49-year-old tablet news users and 7% of 50- to 64-year-old users. On the flip side, though, mobile news users 50 and over are more likely to have paid for some kind of news subscription. These data also examine which demographic groups tend to engage in other kinds of activities on their mobile devices. On both devices, for example, lower income households tend to watch more videos while women stand out as being more engaged in social media activities. And on smartphones, young people emerge as heavier readers of books and magazines. Together, these data provide a window into emerging differences in how people use mobile devices for news and where news ranks among their other mobile activities. Understanding these differences is important for news organizations and others in the mobile realm as they carve new pathways for content – and for revenue to support it.